Who's hungry for an extra-large serving of make-believe? 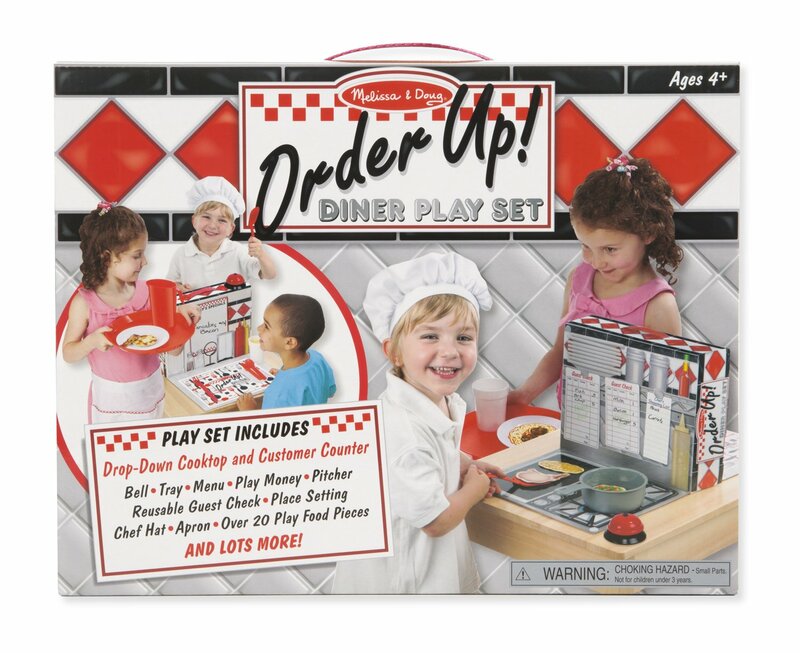 This diner play sethas everything kids need to serve up heaping helpings of fun: a bell, tray,menu, play money, pitcher, reusable guest check, place setting, chef hat,apron, over 20 play foods, and lots more! The box sides flip down to create anauthentic diner experience, with a cooktop on one side and customer counter onthe other. Kids can be a chef, server, diner, or all 3--it's an all-you-can-play special! From the Manufacturer Melissa & Doug toys are designed to nurture creativity and imagination. Fromclassic wooden toys to creative crafts, pretend play, and games, Melissa &Doug's products inspire exploration and enrich children's lives in a waythat's as engaging as playtime itself! Since the Company's founding more than25 years ago, Melissa & Doug has consistently delivered innovative children'sproducts with a commitment to uncompromising quality, safety, service andvalue. Well-designed, durable playthings should be accessible to all, andMelissa & Doug strives to foster wonder and a lifelong love of learning inchildren throughout the world.